Palliative endoscopic biliary stenting is routinely performed in patients with nonresectable, distal, malignant biliary strictures. The endoscopic transpapillary approach based on the ERCP technique is an established treatment for nonsurgical relief of malignant biliary obstruction (MBO). However, ERCP is not always successful even when performed by skilled endoscopists. Several underlying reasons include the presence of intradiverticular papillae, long narrow distal segment of the distal bile duct, altered anatomy, and gastroduodenal obstruction. When ERCP fails, percutaneous transhepatic biliary drainage (PTBD) or surgical bypass procedures are performed as salvage therapies. Percutaneous access and surgical options are associated with morbidity, mortality, expense, and requirement of substantial expertise. The EUS-guided biliary drainage (EUS-BD) was first demonstrated by Wiersema et al. in 1996. Subsequently, various improvizations for EUS-BD techniques occurred such as EUS-guided choledochoduodenostomy (EUS-CDS), hepaticogastrostomy (HGS), antegrade stenting (AGS), and rendezvous procedure (RV). These tichiques all have recently been shown to be useful for biliary drainage after unsuccessful ERCP. Since no international guidelines or consensus for the EUS-BD exist, the formulation of questions used was based on the opinions of regional experts regarding what constitutes the most important aspects or controversial areas of EUS-BD, e.g., which method of EUS-BD should be preferred based on the site of biliary obstruction? How should EUS-BD be performed? To this end, a consensus among leading experts on EUS-BD based on a survey of EUS-BD techniques would be helpful in understanding practice patterns worldwide. A 10-question survey regarding the practice of EUS-BD was circulated among members of the International Society of EUS in February 2018. Before completing the survey, participants were reminded that the questions listed were only directed toward EUS-BD. The responses to the questions were reported anonymously. The questions contained within the questionnaire were grouped under several sections, including which method is better, the type of stent used for drainage, the length of stent, and endoscopic tools utilized for creating a fistula, among other categories. Statements were formulated by combining a formal literature review of the endoscopic treatment of MBO with expert opinions from the members of the International Society of EUS. 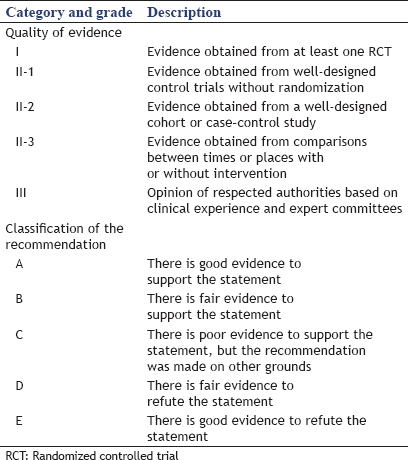 The quality of evidence and classification of recommendation categories for the questionnaire are shown in [Table 1]. EUS-BD is increasingly used as an alternate therapeutic modality to PTBD for biliary obstruction in patients who fail ERCP. Can EUS-BD replace PTBD as a remedy method after failure of ERCP? The majority of endoscopists (73.08% [38/52]) felt that EUS-BD may replace PTBD as a drainage method after failure of ERCP, 17.31% (9/52) of the endoscopists felt that PTBD is still the first choice, and 9.62% (5/52) of the endoscopists did not have any preference. Some of them believed that the better choice depends on the center of excellence and professionalism of the available operator. In addition, a few of them believed that EUS-BD and PTBD are equal and the choice depends on individual situations. Regarding the PTBD status, what is a better alternative method (PTBD or EUS-BD) for patients after failure of ERCP? In recent years, EUS-BD has been increasingly applied in MBO therapy, with gradual appreciation of its advantages. Compared with PTBD, the most prominent advantage of EUS-BD is that it will not cause electrolyte imbalance due to external bile drainage. There are some well-designed control trials supporting this point. Sharaiha et al. reviewed nine studies that included 483 patients in total. There was no difference in technical success between the two procedures (EUS-BD and PTBD), but EUS-BD was associated with better clinical success, fewer postprocedure adverse events (AEs), and lower rate of reintervention. When ERCP fails to achieve biliary drainage, EUS-guided interventions may be preferred over PTBD if adequate advanced endoscopy expertise and logistics are available. Khashab et al. evaluated 73 jaundice patients with distal MBO who either underwent EUS-BD (n = 22) or PTBD (n = 51) after failure of ERCP. Technical success, clinical success, and AEs between the two groups were compared. Although technical success rate (TSR) was higher in the PTBD group (100 vs. 86.4%, P = 0.007), clinical success rate was equivalent (92.2 vs. 86.4%, P = 0.40). PTBD was associated with a higher AE rate (index procedure: 39.2 vs. 18.2%; all procedures including reinterventions: 80.4 vs. 15.7%). EUS-BD and PTBD were found to be comparably effective techniques for the treatment of distal MBO after failure of ERCP. However, EUS-BD was associated with a reduced AEs rate and is significantly less expensive due to the need for fewer reinterventions. An international multicenter survey was conducted in seven tertiary referral centers about patient perception and preference of EUS-BD and PTBD. Three hundred and twenty-seven patients with suspected MBO were enrolled in the study. Patients were questioned regarding their choice between EUS-BD and PTBD after failure of ERCP, the reasons for their preference, and whether altering AE rates would influence their prior choice. In total, 313 patients (95.7%) responded to the questionnaire and 251 (80.2%) preferred EUS-BD. The main reason for choosing EUS-BD was the possibility of internal drainage (78.1%). Of course, if interventional radiologists or gastroenterologists with adequate experience on ultrasound-guided percutaneous techniques were invited to take part in this survey, the preference for EUS-BD vs. PTBD may have been lower. In a potential clinical situation, which EUS-BD technique should be the first choice for MBO: Rendezvous stenting (RV), EUS-AGS, or EUS-HGS/CDS? In the comparison of EUS-BD methods, 31.91% (15/47) endoscopists felt that RV should be the first choice for MBO, while 29.79% (14/47) felt that EUS-CDS should be the first choice; 23.40% (11/47) endoscopists had no specific preference. A few of them believed that it depends on several factors, in particular (a) anatomy of the upper gastrointestinal (GI) tract and possible access route; (b) localization of the biliary obstruction; (c) presence of ascites yes/no; in most cases, the rendezvous or antegrade technique would still be the first choice. In addition, 10.64% (5/47) of the endoscopists felt that the EUS-guided antegrade technique should be the first choice, and 4.26% (2/47) felt that EUS-HGS should be the first choice. EUS-BD is an emerging alternative to PTBD or surgery after failure of ERCP.,, EUS-BD can be performed in three ways: EUS-HGS, CDS, and RV therapy.,,,,,,,, Once a decision to perform EUS-BD has been made, the next step is to determine which biliary approach should be selected. At present, there are no optimal answers such as practical guidelines regarding the selection of EUS-BD. Thus far, the selection of the EUS-BD approach depends on the patient's condition, which may involve the presence of gastric outlet obstruction, site of biliary obstruction, Roux-en-Y anastomosis, or preference of endoscopists. EUS-RV seems to be the safest of all three approaches. Most experts agree that, if conditions permit, the duodenal papilla represents the most reasonable route. There are some well-designed control trials supporting this point. In the study by Iwashita et al., a total of 40 patients underwent salvage EUS-RV immediately after failure of biliary cannulation. A dilated intra- or extra-hepatic biliary duct (IHBD or EHBD) was punctured from the stomach or small intestine under EUS guidance followed by cholangiography and antegrade manipulation of the guide wire into the small intestine. Antegrade manipulation of the guide wire into the small intestine was achieved in 29 of 40 patients (73%; EHBD 25/31 and IHBD 4/9). Complications occurred in five patients (13%) and included pancreatitis, abdominal pain, pneumoperitoneum, and sepsis/death, which were believed to be unrelated to the procedure. The conclusion of their study was that EUS-RV is safe and effective and should be considered as a primary salvage technique after failure of cannulation. In the study by Holt et al., a total of 524 native papilla ERCPs were performed. Cannulation was unsuccessful in 0.6% (3/518) of cases when ampulla was accessible. EUS-BD was indicated in 0.6% (3/524) of all referred native papilla ERCPs. EUS-BD was successful in all cases. The choice and sequence of biliary devices, cannulation method, and postprocedural management were at the endoscopists' discretion. As per the departmental protocol, all patients with failure of ERCP were assessed for EUS-BD [Figure 1]. In EUS-guided biliary interventions, the access and drainage routes should be chosen depending on the indication, level of the biliary obstruction, anatomical condition of the upper GI tract, and operator's experience. EUS-RV may not be possible in all cases with impossible endoscopic access to papilla or hepaticojejunostomy. In the study by Tyberg et al., a new algorithm was presented. Patients with a dilated IH biliary tree (IHBT) on cross-sectional imaging received treatment with an IH approach with anterograde biliary stent placement, or HGS stent placement if anterograde placement was not feasible. Patients with a nondilated IHBT on cross-sectional imaging underwent treatment with an extrahepatic (EH) approach with an RV technique, or transenteric stent placement if the RV technique was not feasible. Patients underwent the drainage procedure according to the novel algorithm. Fifty-two patients were included in the registry. Technical success was achieved in 50 patients (96%). AEs were observed in five patients. Uemura et al. reviewed 10 studies involving 434 patients, of whom 208 underwent biliary drainage via HGS and the remaining 226 via CDS. The technical success for CDS and HGS was 94.1% and 93.7%, respectively. Clinical success was 88.5% in CDS and 84.5% in HGS. There was no difference in AEs. CDS was approximately 2 min faster than HGS. In the study by Gupta et al., EUS-BD was reviewed across six international centers. In doing so, the EH and IH approaches were compared. Two hundred and forty patients (with a mean age 67.3 years) underwent EUS-BD. Success was achieved in 87% cases, with a similar success rate in EH and IH approaches (84.3% vs. 90.4%; P = 0.15). No significant difference was noted between the IH and the EH approaches (32.6% vs. 35.6%; P = 0.64). Poincloux et al. evaluated 101 patients (malignant = 98, benign = 3) in whom ERCP previously failed and who underwent treatment with an IH or EH EUS approach with transluminal stenting or an EUS-RV with transpapillary stent placement. A total of 71 patients underwent the IH approach, and 30 underwent the EH approach. TSR and clinical success rates were 98.0% and 92.1%, respectively. There was no difference in efficacy between HGS and CDS (94% vs. 90%; P = 0.69) or in major complications (10.6% vs. 6.7%; P = 1). Larger prospective and multicenter studies are needed to better define the indications, outcomes, and complications. In a clinical situation, which transhepatic technique do you usually choose? EUS-AGS, or EUS-HGS? In your opinion, which technique has higher TSR and clinical success rates? In the transhepatic technique, 51.06% (24/47) endoscopists preferred EUS-HGS, while 42.55% (20/47) endoscopists preferred the EUS-guided antegrade technique; 6.38% (3/47) endoscopists did not have a preference. Evidence has been obtained from some well-designed cohorts. Some experts prefer the IH route which may be safer for antegrade procedures, with lower risk of bile leakage compared with the EH approach., The absence of bile leak at the point puncture is due the liver parenchyma (around the IHBD) tamponading the temporary fistula. There was not any clinical studies compared the technical and clinical success between AGS and HGS. Weilert et al. assessed 21 consecutive patients who underwent EUS-BD drainage for failed ERCP. Technical success was achieved in 20/21 (95.2%) patients, while clinical success was achieved in 19/21 (90.4%). Anterograde interventions were performed in 16/20 (80%), while 3/20 (15%) underwent rendezvous and 1/20 (5%) underwent CDS. In their study, EUS-guided antegrade biliary drainage using the IH access route resulted in a high technical and clinical success rate with a low risk of AEs. Poincloux et al. studied a total of 71 patients who underwent treatment with an IH approach (5 EUS-guided antegrade technique and 66 EUS-HGS). Technical and clinical success was achieved in all patients who underwent the EUS-guided antegrade technique, and no procedural complications were observed. In patients undergoing EUS-HGS, the technical success was 98.5% (65/66). The EUS antegrade technique appears to be a safe and effective salvage option after failure of ERCP, but the success rate of drainage is low compared with EUS-transluminal BD because of relative complicated procedure. EUS-HGS combined with AGS (EUS-HGAS) is a modified HGS technique that is superior to HGS in terms of the AE rate and stent patency. When stent dysfunction occurs, reintervention is more difficult after AGS alone than after HGS or CDS. In a study by Ogura et al. 's study, EUS-HGAS was evaluated. A total of 49 patients were enrolled. The TSR of EUS-HGS was 95.8% (47/49). EUS-AS failed in five patients because the guide wire could not be advanced into the intestine across the bile duct obstruction site. EUS-HGAS has the clinical benefit of obtaining a long stent patency and avoiding AEs, such as bile peritonitis. In a study by Imai et al., EUS-HGS and EUS-HGAS were compared in terms of TSR, FSR, AE rates, reintervention rates, patient survival time, and time to stent dysfunction or patient death. They concluded that, although the TSR of HGS with AGS was lower than that of EUS-HGS, EUS-HGAS was superior to EUS-HGS in terms of AE rate and stent patency. Should self-expandable metal stent (SEMS) become the standard of care for the creation of EUS-BD? Most endoscopists (87.23%, 41/47) felt that SEMS should become the standard choice for EUS-BD; 4.26% (2/47) felt that SEMS should not become the standard choice; and 8.51% (4/47) endoscopists had no particular preference. A few of them felt that SEMS is the first choice in EUS-CDS and plastic stent (PS) is the first choice in EUS-HGS. Multiple studies have clearly demonstrated the superiority of the SEMS over plastic stents in terms of long-term patency, complications, and reinterventions., Wang et al. reviewed a total of 42 studies that included 1192 patients. The TSR, FSR, and AE rates were 94.71%, 91.66%, and 23.32%, respectively. Metal stents were used in 24 studies involving 525 patients and plastic stents were used in five studies involving 58 patients. The FSR of studies using plastic and mental stents was 98.24% and 94.51%, respectively. There was no statistical difference between the two groups (P = 0.343). The AE rate of the mental stent group was lower than that of the plastic stent (P = 0.013). Schmidt et al. performed a randomized, multicenter study comparing stent patency, and complication rates between plastic stent and SEMS in patients with unresectable, malignant, distal, and biliary obstruction. In their study, the frequency of stent failure was significantly higher in the plastic stent group compared with the SEMS group. A high incidence of early stent failure within 8 weeks was observed in the plastic group. Thus, the plastic stent may not be appropriate for mid- or long-term drainage of MBO. Which type of SEMS will be better for EUS-HGS: Fully-covered (FC) or partially-covered (PC)? In total, 44.68% (21/47) endoscopists felt that FC SEMSs are better, while 44.68% (21/47) felt that half-covered SEMSs are better, and 8.51% (4/47) endoscopists did not have a specific preference. SEMSs are widely used for MBOs. Both FC and PC SEMS are now commercially available for distal MBO. While FC SEMS can be easily removed at the time of reintervention, they are theoretically prone to migration. There is no consensus on the best stent type for the management of MBO. Evidence has been obtained from some well-designed cohorts. In the study by Rai et al., 6-cm PC SEMSs were used in patients undergoing EUS-CDS. Technical success was achieved in 28 patients, all of which also exhibited clinical success. Three patients had AEs (bile leak, hemobilia, stent block in one patient each; no stent migration), although none of these AEs were major and all were managed successfully. EUS-CDS with a PC SEMS results in a high technical and clinical success, whereas a number of AEs were infrequent, minor and could be easily managed. In the study by De Cassan et al., a dedicated biliary SEMS with a PC SEMS was used to perform EUS-HGS. A total of 41 patients were included. Technical success was achieved in 37 (90.2%) patients. Thirteen patients (31.7%) presented an early complication, which was generally an infection. At the 6-month follow-up, 10/37 patients (27.0%) required a new biliary drainage and 11/37 (29.7%) died because of their disease. During the transhepatic approach, what instrument did you choose to create the hepatogastric fistula if hot AXIOS or other metal stent with hot delivery was not aviluable? During the transhepatic approach, 47.83% (22/46) endoscopists recommended 6-Fr cystotomes to generate a hepatogastric fistula, 15.22% (7/46) endoscopists recommended 6-Fr and 7-Fr tapered biliary dilator catheters, and 15.22% (7/46) endoscopists did not have a preference. Biliary balloon dilator (4 mm), specific dilator (7-Fr), and 5–4–3 contour catheter over 0.025” guidewire were recommended by them. To create a hepatogastric fistula, different studies have described the use of different instruments, such as tapered biliary dilator catheters, different models of cystotomes, fistulotome, and needle knife. No research has been done to confirm which devices are better. A Korean study is the only one that showed higher complications (pneumoperitoneum or bleeding) with needle knife. In the survey, 6-Fr cystotomes were recommended by most endoscopists. During the CDS procedure, what instrument did you choose to create a fistula if hot AXIOS or other metal stent with hot delivery was not aviluable? During the CDS approach, 40.43% (19/47) of endoscopists recommended 6-Fr cystotome to make a fistula, 12.77% (6/46) of endoscopists recommended 6-Fr and 7-Fr tapered biliary dilator catheters, and 27.66% (13/46) of endoscopists did not have a specific preference. During the HGS approach, what length of SEMS was recommended? During the HGS approach, 68.09% (32/47) of endoscopists recommended longer SEMS (8 or 10 cm). No research has proven the ideal length of SEMS. In the survey, we found that most endoscopists recommended an 8-cm or 10-cm SEMS. This may be because the distance between the left hepatic duct and the stomach is longer, thereby necessitating a longer stent. Under such circumstances, the stent migration rate is relatively low. During the CDS procedure, what length of SEMS is recommended if LAMS is not available? During the CDS approach, 50% (23/46) of endoscopists recommended a 6-cm SEMS. Which IH segment do you usually choose during IH approach? During the IH approach, 59.57% of (28/47) endoscopists recommended puncture of the IH segment 3. In our endoscopy center, EUS-BD is the first choice as a drainage method after failure of ERCP. A study on EUS-BD using a FC metallic stent after failure of ERCP at our center showed it to be a safe and effective method for the treatment of obstructive jaundice. The TSR and clinical success rates were both 100%. There was no difference in efficacy between HGS and CDS. AEs occurred in three patients, including two in the HGS group (1 bile leakage and 1 sepsis) and one in the CDS group (sepsis). In clinical situations, EUS-RV was always chosen to be a primary salvage technique after failure of cannulation at our center. The duodenal papilla represents the most reasonable route. Larger prospective and multicenter studies are needed to better define the indications, outcomes, and complications. For the IH technique, EUS-AGS was the first choice at our center which may be safer for antegrade procedures, with lower risk of bile leakage. The technique appears to be safe and effective for salvage after failure of ERCP, but the success rate of drainage is low compared with EUS-transluminal biliary drainage, as it is a relatively difficult procedure. The drainage of the common bile duct can be achieved by two different types of stents, plastic stent, and metal stent. SEMS should become the standard choice for EUS-BD. In most studies, there were no differences in TSR and FSR between the metal and plastic stents. However, AEs were lower with metal stents. FC and PC SEMSs are now commercially available for distal MBO. While FC SEMS can be easily removed at the time of reintervention, they are theoretically prone to migration. The migration rate using PC SEMS is lower than FC stent in our center. Larger prospective and multicenter studies are needed to compare the outcomes and complications between FC and PC stent. During the EUS-BD approach, 6-Fr cystotome was always used to make a fistula at Sun's center. Moreover, 8-cm or 10-cm SEMS was always used during the HGS approach to avoid migration. In addition, 6-cm SEMSs were always used during CDS approach. During the IH approach, segment 2 was always chosen at Sun's center because of a relatively high success rate. However, when B2 puncture is made in the cardia or the esophageal gastric junction, there is a problem of bile reflux into the esophagus. Hence, it is more reasonable for EUS-AGS to select B2 as the puncture site. There are some other arguments on EUS-BD as well. First, can EUS-BD replace ERCP? EUS-BD can not only be used for ERCP failure cases but can also be applied to patients in whom ERCP cannot be attempted (such as gastric outlet obstruction). Even some proponents believe that EUS-BD may replace ERCP as the preferred treatment for drainage in MBO, thus avoiding ERCP associated pancreatitis. There are limited data on the comparison of the clinical efficacy of EUS-BD and ERCP with regard to the treatment of choice. As EUS-BD is performed under direct visualization, it has the potential to replace ERCP. In a multicenter retrospective study, Dhir et al. compared EUS-BD and ERCP for the relief of distal MBO. The conclusion was that the short-term outcome of EUS-BD is comparable to that of ERCP in patients with malignant distal common bile duct (CBD) obstruction. In a new prospective randomized controlled study by Park et al., the efficacy and safety of EUS-BD and ERCP in MBO were compared. Thirty patients with EH malignant biliary tract obstruction were enrolled; 15 each in the EUS-BD and ERCP-BD arms. There were no significant differences both in terms of TSR and clinical success rates; 100% vs. 93% and 93% vs. 100% in ERCP-BD vs. EUS-BD, respectively. Four patients (31%) had tumors in growth-caused stent dysfunction in the ERCP-BD group, whereas two patients each had food impaction and stent migration in the EUS-BD group. This prospective, randomized controlled study suggested that EUS-BD has a similar safety profile as ERCP-BD. Second, in some patients with recurrent cholangitis after EUS-BD, what should we do? In the study by Nakai et al., 16 patients with prior BD for MBO undergoing conversion to EUS-BD using a temporary ENBD tube placement were studied. After a median duration of 6 days, subsequent conversion to EUS-BD using a covered metal stent was performed, which was technically and clinically successful in all 16 patients. AEs were observed in three patients (19%): one bleeding, one cholecystitis, and one cholangitis. Based on the consensus, the majority of endoscopists felt that EUS-BD can replace PTBD as a remedial method after failure of ERCP. Among all EUS-BD methods, most endoscopists felt that the RV technique should be the first choice. Most endoscopists also felt that SEMS should become the standard choice for EUS-BD. A 6-Fr cystotome is recommended by most endoscopists for generating a fistula. During the transgastric-transhepatic approach, a longer SEMS (8 or 10 cm) is recommended, while during the transduodenal-transcholedochal approach, a 6-cm SEMS is recommended. This is the first worldwide survey on the practice of EUS-BD for MBO. There are wide variations in practice; hence, randomized studies are urgently needed to establish the best approach for the management of this condition. This study was supported by the Natural Science Foundation of Liaoning Province (Grant No. MS0038), and Shengjing Free Researcher Project Foundation (Grant No. MF73). We thank all doctors who participated in this study. Tsujino T, Kawabe T, Komatsu Y, et al. Endoscopic papillary balloon dilation for bile duct stone: Immediate and long-term outcomes in 1000 patients. Clin Gastroenterol Hepatol 2007;5:130-7. Bahra M, Jacob D. Surgical palliation of advanced pancreatic cancer. Recent Results Cancer Res 2008;177:111-20. Gupta K, Mallery S, Hunter D, et al. Endoscopic ultrasound and percutaneous access for endoscopic biliary and pancreatic drainage after initially failed ERCP. Rev Gastroenterol Disord 2007;7:22-37. Wiersema MJ, Sandusky D, Carr R, et al. Endosonography-guided cholangiopancreatography. Gastrointest Endosc 1996;43:102-6. Godat S, Bories E, Caillol F, et al. Efficacy and safety in case of technical success of endoscopic ultrasound-guided transhepatic antegrade biliary drainage: A report of a monocentric study. Endosc Ultrasound 2017;6:181-6. De Cobelli F, Marra P, Diana P, et al. Therapeutic EUS: Biliary drainage – The interventional radiologist's perspective. Endosc Ultrasound 2017;6:S127-31. Park DH. Endoscopic ultrasonography-guided hepaticogastrostomy. Gastrointest Endosc Clin N Am 2012;22:271-80, ix. Burmester E, Niehaus J, Leineweber T, et al. EUS-cholangio-drainage of the bile duct: Report of 4 cases. Gastrointest Endosc 2003;57:246-51. Park DH, Jang JW, Lee SS, et al. EUS-guided biliary drainage with transluminal stenting after failed ERCP: Predictors of adverse events and long-term results. Gastrointest Endosc 2011;74:1276-84. Eum J, Park DH, Ryu CH, et al. EUS-guided biliary drainage with a fully covered metal stent as a novel route for natural orifice transluminal endoscopic biliary interventions: A pilot study (with videos). Gastrointest Endosc 2010;72:1279-84. Park DH, Song TJ, Eum J, et al. EUS-guided hepaticogastrostomy with a fully covered metal stent as the biliary diversion technique for an occluded biliary metal stent after a failed ERCP (with videos). Gastrointest Endosc 2010;71:413-9. Giovannini M, Bories E. EUS-guided biliary drainage. Gastroenterol Res Pract 2012;2012:348719. Bories E, Pesenti C, Caillol F, et al. Transgastric endoscopic ultrasonography-guided biliary drainage: Results of a pilot study. Endoscopy 2007;39:287-91. Nakai Y, Isayama H, Matsubara S, et al. Conversion of transpapillary drainage to endoscopic ultrasound-guided hepaticogastrostomy and gallbladder drainage in a case of malignant biliary obstruction with recurrent cholangitis and cholecystitis (with videos). Endosc Ultrasound 2017;6:205-7. Artifon EL, Loureiro JF, Baron TH, et al. Surgery or EUS-guided choledochoduodenostomy for malignant distal biliary obstruction after ERCP failure. Endosc Ultrasound 2015;4:235-43. Savides TJ, Varadarajulu S, Palazzo L; EUS 2008 Working Group. EUS 2008 working group document: Evaluation of EUS-guided hepaticogastrostomy. Gastrointest Endosc 2009;69:S3-7. Iwashita T, Lee JG, Shinoura S, et al. Endoscopic ultrasound-guided rendezvous for biliary access after failed cannulation. Endoscopy 2012;44:60-5. Fusaroli P, Jenssen C, Hocke M, et al. EFSUMB guidelines on interventional ultrasound (INVUS), part V. Ultraschall Med 2016;37:77-99. Tyberg A, Desai AP, Kumta NA, et al. EUS-guided biliary drainage after failed ERCP: A novel algorithm individualized based on patient anatomy. Gastrointest Endosc 2016;84:941-6. Uemura RS, Khan MA, Otoch JP, et al. EUS-guided choledochoduodenostomy versus hepaticogastrostomy: A systematic review and meta-analysis. J Clin Gastroenterol 2018;52:123-30. Gupta K, Perez-Miranda M, Kahaleh M, et al. Endoscopic ultrasound-assisted bile duct access and drainage: Multicenter, long-term analysis of approach, outcomes, and complications of a technique in evolution. J Clin Gastroenterol 2014;48:80-7. Poincloux L, Rouquette O, Buc E, et al. Endoscopic ultrasound-guided biliary drainage after failed ERCP: Cumulative experience of 101 procedures at a single center. Endoscopy 2015;47:794-801. Shah JN, Marson F, Weilert F, et al. Single-operator, single-session EUS-guided anterograde cholangiopancreatography in failed ERCP or inaccessible papilla. Gastrointest Endosc 2012;75:56-64. Weilert F. Prospective evaluation of simplified algorithm for EUS-guided intra-hepatic biliary access and anterograde interventions for failed ERCP. Surg Endosc 2014;28:3193-9. Kim YS, Gupta K, Mallery S, et al. Endoscopic ultrasound rendezvous for bile duct access using a transduodenal approach: Cumulative experience at a single center. A case series. Endoscopy 2010;42:496-502. Davids PH, Groen AK, Rauws EA, et al. Randomised trial of self-expanding metal stents versus polyethylene stents for distal malignant biliary obstruction. Lancet 1992;340:1488-92. Kaassis M, Boyer J, Dumas R, et al. Plastic or metal stents for malignant stricture of the common bile duct? Results of a randomized prospective study. Gastrointest Endosc 2003;57:178-82. Schmidt A, Riecken B, Rische S, et al. Wing-shaped plastic stents vs. Self-expandable metal stents for palliative drainage of malignant distal biliary obstruction: A randomized multicenter study. Endoscopy 2015;47:430-6. Rai P, Lokesh CR, Goel A, et al. Endoscopic ultrasound-guided choledochoduodenostomy using partially-covered self-expandable metal stent in patients with malignant distal biliary obstruction and unsuccessful ERCP. Endosc Int Open 2018;6:E67-72. De Cassan C, Bories E, Pesenti C, et al. Use of partially covered and uncovered metallic prosthesis for endoscopic ultrasound-guided hepaticogastrostomy: Results of a retrospective monocentric study. Endosc Ultrasound 2017;6:329-35. Itoi T, Isayama H, Sofuni A, et al. Stent selection and tips on placement technique of EUS-guided biliary drainage: Transduodenal and transgastric stenting. J Hepatobiliary Pancreat Sci 2011;18:664-72. Park DH, Jang JW, Lee SS, et al. EUS-guided transhepatic antegrade balloon dilation for benign bilioenteric anastomotic strictures in a patient with hepaticojejunostomy. Gastrointest Endosc 2012;75:692-3. Guo J, Sun S, Liu X, et al. Endoscopic ultrasound-guided biliary drainage using a fully covered metallic stent after failed endoscopic retrograde cholangiopancreatography. Gastroenterol Res Pract 2016;2016:9469472. Park JK, Woo YS, Noh DH, et al. Efficacy of EUS-guided and ERCP-guided biliary drainage for malignant biliary obstruction: Prospective randomized controlled study. Gastrointest Endosc 2018;88:277-82. Nakai Y, Isayama H, Yamamoto N, et al. Conversion to endoscopic ultrasound-guided biliary drainage by temporary nasobiliary drainage placement in patients with prior biliary stenting. Endosc Ultrasound 2017;6:323-8.